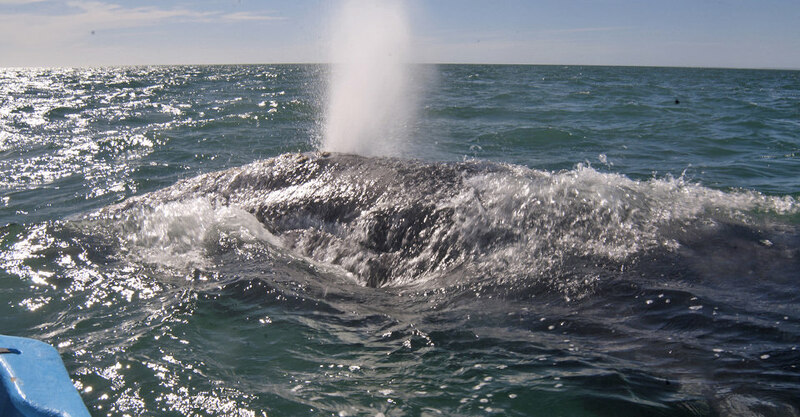 Gray Whale - Greatest Endurance Athlete in the World? Humans, eat your heart out—in the animal kingdom, there are many endurance athletes! The monarch butterfly flies 3,000 miles to its winter grounds in Mexico. Caribou (also known as reindeer), which are found in the northern parts of Europe, Asia and North America, can travel up to 3,100 miles (5,000 km) in search for food. And dragonflies, if you can believe this, travel up to 10,500 miles (17,000 km) in Asia, making theirs the greatest and longest migration among any members of the insect family in the world—so long that it takes four generations per migration. None of them, however, can compete with the world champion of the mammals, if not all animals—the great gray whale. Recently, a member of the critically endangered western gray whale population broke the record for longest recorded mammal migration in the world. The nine-year-old female named Varvara swam from Sakhalin Island, Russia, to its traditional breeding and birthing grounds in Cabo San Lucas, Baja California. In doing so, she logged 14,000 miles (22,511 kilometers) over 172-days—that’s an average of 81.4 miles per day every day for almost half a year! Now, I currently live in a very outdoor/nature-oriented place, where everyone seems to be ultra-extreme enduro all things athletic: runners, bikers, skiers, etc. And we seem to live in this ultra-competitive world where everyone is trying to physically outdo each other – (wo)man breaks record for X number of marathons ran for Y number of days in a row. But in my mind, we all have nothing on Varvara, who is simply swimming to survive, literally, for herself and her species. You see, Varvara’s group of the western north Pacific gray whale population is as low as 150 individuals worldwide. 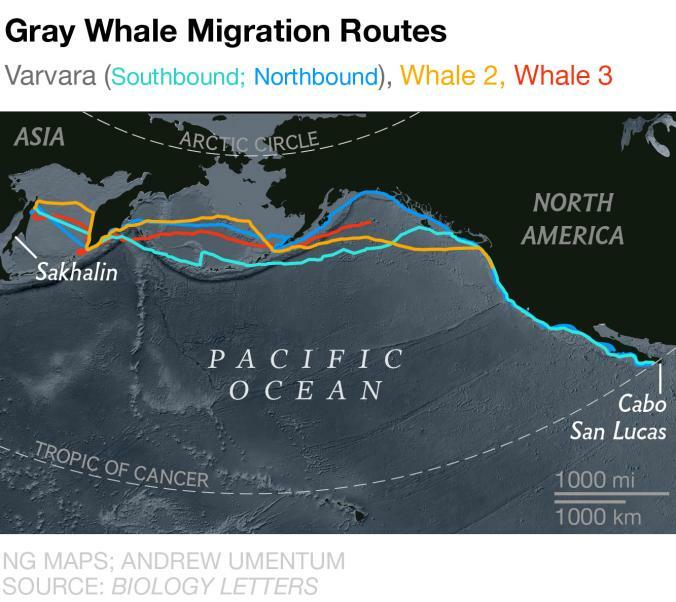 And while much is known about the eastern Pacific gray whale that migrates from Alaska’s Bering Sea to Baja, this small, mysterious group of critically endangered relatives off the Russian coast was thought to remain isolated and little was known about them. Until know. acific gray whales is whether they are actually a separate group of whales or a subset of a larger population. The question we all face is, what can we do to protect and preserve this gentlest, most friendly and majestic sea creature on the planet? 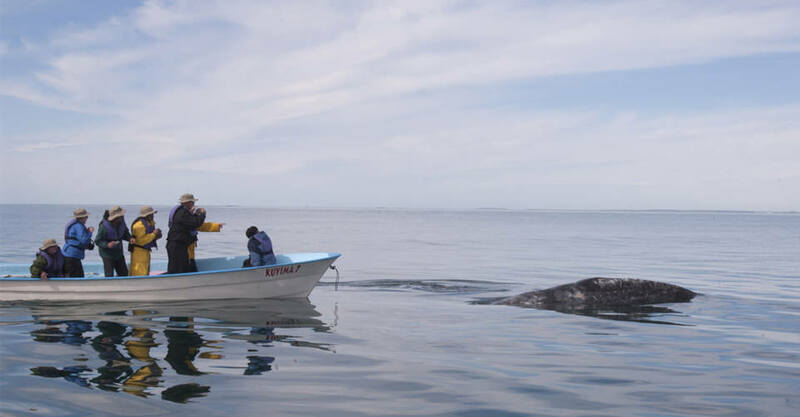 To learn more about conservation efforts to preserve the giant gray whales, visit the World Wildlife Fund (WWF) or get up close and personal with this gentle giant in Baja, Mexico, on a Natural Habitat Adventures trip of a lifetime.